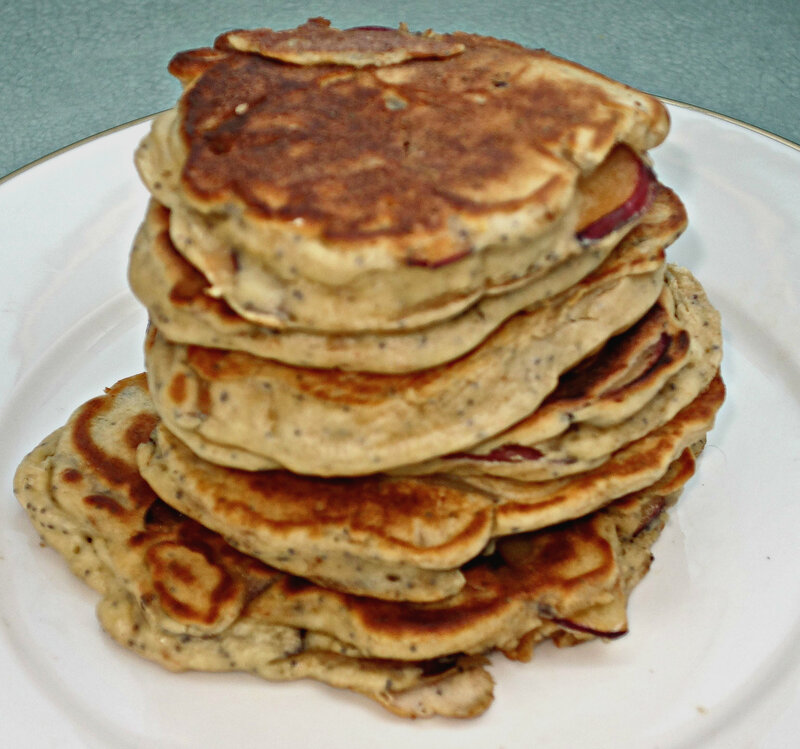 Here’s a secret—I have really bad luck with a few breakfast dishes, mainly the ones that require flipping. I’m flipping challenged. So my omelettes always end up broken and really turn into a hybrid halfway between scrambled eggs and omelettes. I mean, they generally taste good, but I’ve yet to master the skill of creating a perfect omelette folded around a delicious filling. That should actually be a New Year’s resolution this year: I will conquer the omelette in 2014! But, anyway, in the meantime, while I’ve been omelette challenged, I’ve gotten really good at a few egg dishes that don’t require flipping, especially frittatas. Chances are, you’ve probably had a frittata, even if it was called something else, like a baked omelette or crustless quiche or torta. It’s basically whatever fillings your heart desires, mixed with eggs, and topped with cheese. You start it on the stove and finish in the oven. I’ve seen recipes that call for six eggs and a little cheese and broccoli and I’ve seen recipes that call for three eggs and a million vegetables—the egg to filling ratio is really based on preference, and in my, case, often what I have on hand. I started by preheating the oven to 450 degrees and heating a little bit of olive oil and about a tablespoon of butter in my 8-in. 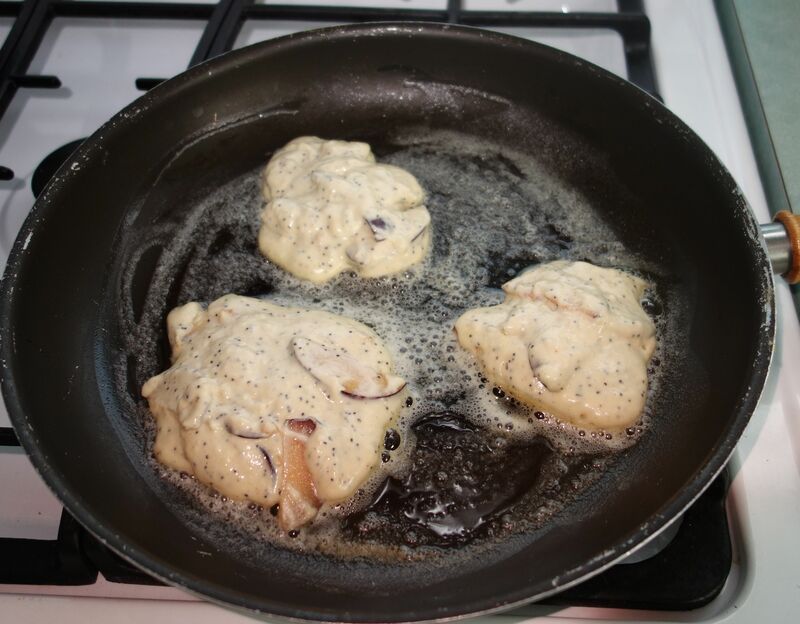 cast iron skillet (Hey, Mary, look – I still use the skillet you gave me when we were in college!). Then I added one small baking potato, thinly sliced, a teeny onion and about 4 oz. sliced mushrooms. Plus some salt, pepper and dried basil. I sautéed over medium heat until the potatoes were soft and the onions were starting to caramelize. Then I added my greens, in this case, some roughly chopped Lacinato kale (the nice thing about kale is that it can stand up to the eat without melting away to mush. More tender greens, like spinach or arugula, are going be much softer). Then it was time to add the eggs. I used three eggs, whisked together with about a quarter cup of milk. Then I added it to pan. I let it cook stovetop on the pan, while I grated a little cheese (Swiss on this particular day). Then I sprinkled the cheese on top, and, using an oven mitt, moved the skillet to the oven. I check on it regularly, since the time on the stovetop can vary a bit. 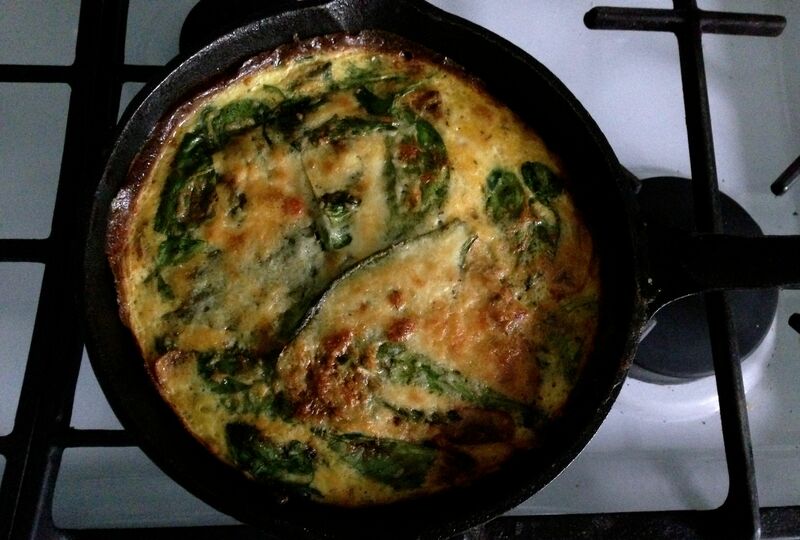 I like my frittata nice and golden on top, but I know other people love them soft and barely set. Mine took about 20 minutes in the oven. Gorgeous and delicious! If you are looking to be fancy, you can invert the pan over a platter (after loosening the frittata with a spatula) and it will fall out just like a cake. Since it was just me, I simply cut myself a generous slice right from the pan. The leftovers are pretty good the next day, but not for much longer after that. Much like a quiche, you’re filling ingredients are only bound by your imagination, and while I mentioned breakfast at the top of the post, there’s no reason this can’t be a nice dinner as well. 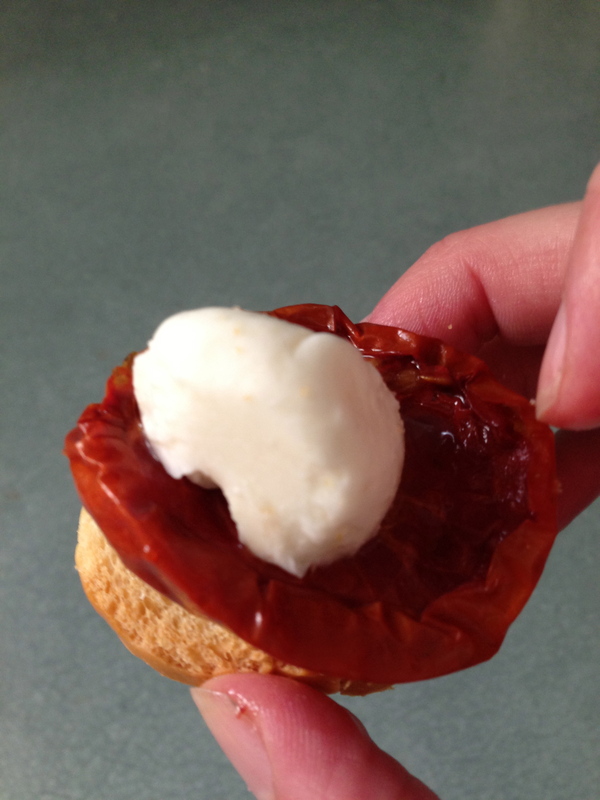 I’ve been doing a 100 Days of Real Food Challenge with my cooking group. No processed food, no refined sugars or flours, etc. Basically, it means eating as close to what Mother Nature provided as I can realistically get. Pretty challenging, as it turns out. Some things, like eating whole grain instead of refined grains, are easier, while others, like trying to bake without refined sugars, is pretty hard (totally changes the texture). I’m mostly doing it out of solidarity with the group – some people are trying it as a real lifestyle change, to eat healthier. 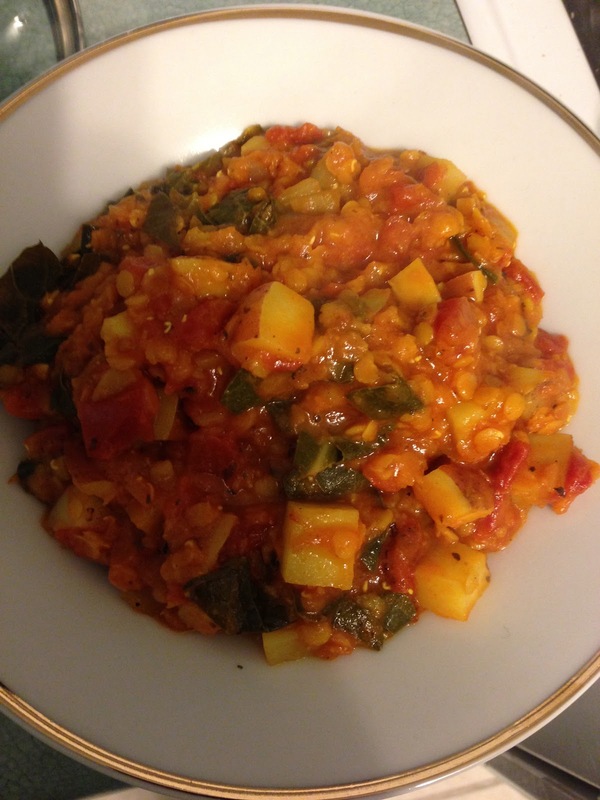 One thing I like about it, is that it challenges me to try new ingredients and new recipes, and I’ve discovered some new dishes that I really enjoy – like this red lentil dish. 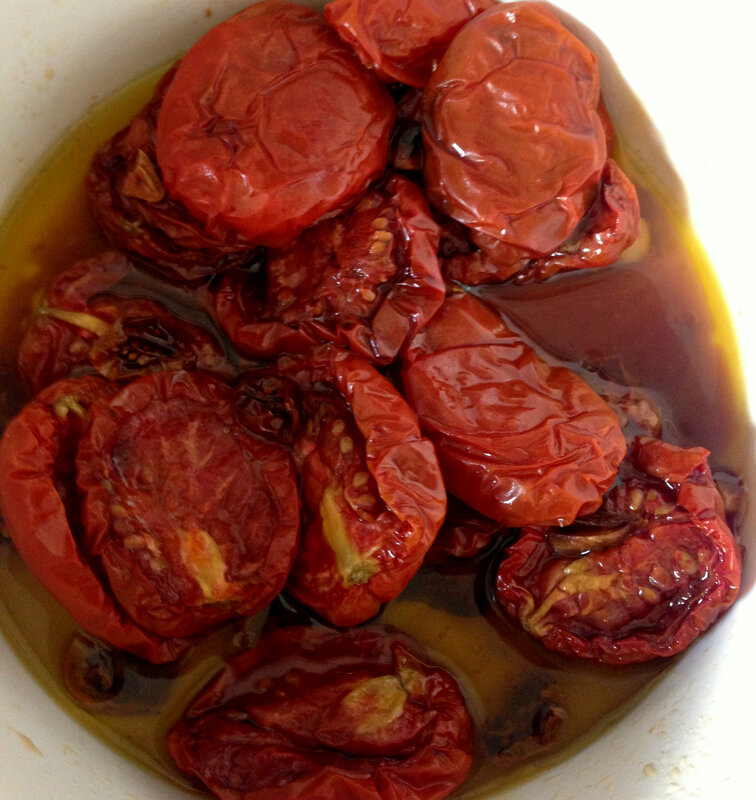 If using fresh tomatoes, dice them, reserving the seeds and juice along with the pieces. Scrub and finely dice the potatoes. Dice the onion and mince the garlic. Heat the oil in a 4-5 qt pan over medium heat, add the seasoning, and sauté the potatoes, onion and garlic until the onions start to soften. Rinse and sort the lentils, if necessary, and add to the pan. Stir in the tomatoes. 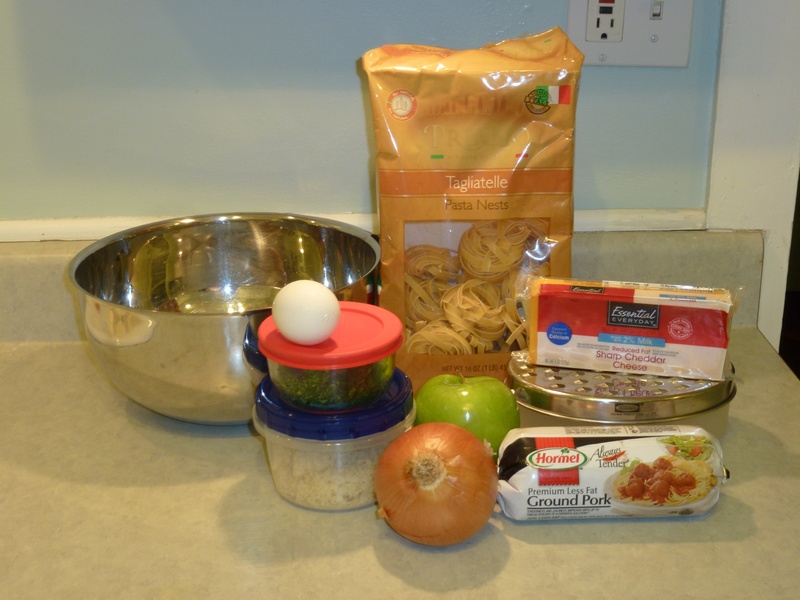 Add enough water to cover the ingredients in the pot. Cover, and let simmer for 30 minutes. 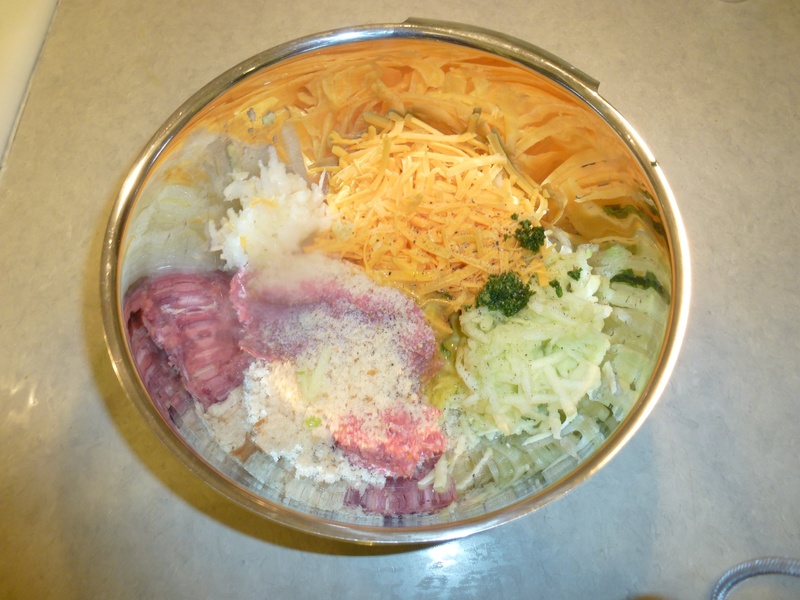 Rinse and slice the greens into ribbons. Add to the pot when the 30 minutes are up, stir in, and simmer, uncovered, until the potatoes are fork tender and the lentils are soft and fluffy. 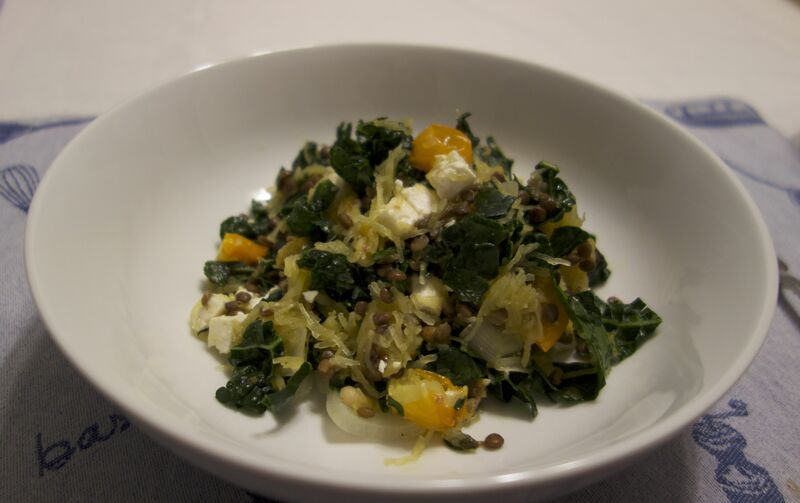 This is one of my go-to dinner recipes, found during the year I had a subscription to EveryDay with Rachael Ray. They’re oh-so-good, and pretty quick and easy too. Mix it up with your hands. Ew, squishy. 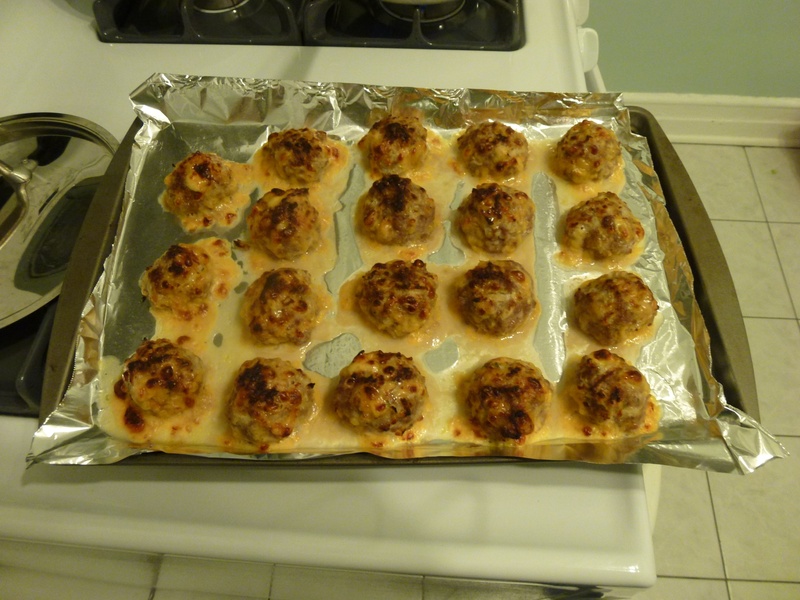 Shape into 16 meatballs and arrange on the baking sheet. Broil the meatballs until golden and cooked through, 8 to 10 minutes. Meanwhile, in a pot of boiling, salted water, cook the noodles until al dente. Drain, then return to the pot and toss with the butter and remaining 5 tablespoons parsley; season with salt and pepper. 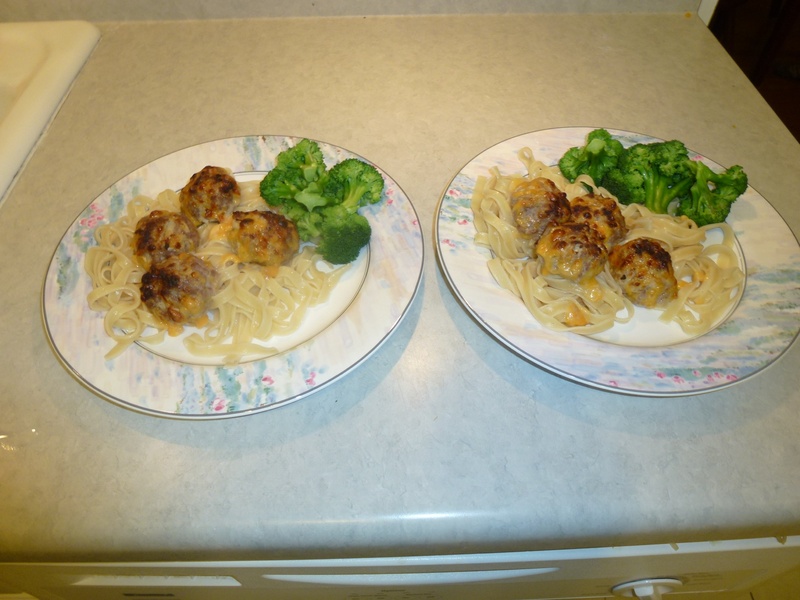 Divide the noodles among 4 plates; top with 4 meatballs each. Bonus points if you make extra and have lunch for the next day! I love pancakes. Nice real fluffy ones, with some taste to them. Ideally with mini chocolate chips. 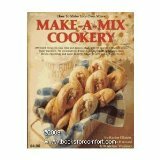 In junior high home ec class, my teacher had a cookbook (from the 70s) called Make a Mix Cookery. Being the cool junior high schooler I was, I was obsessed with this book. I thought it was the coolest thing ever. You could just MAKE MIXES. 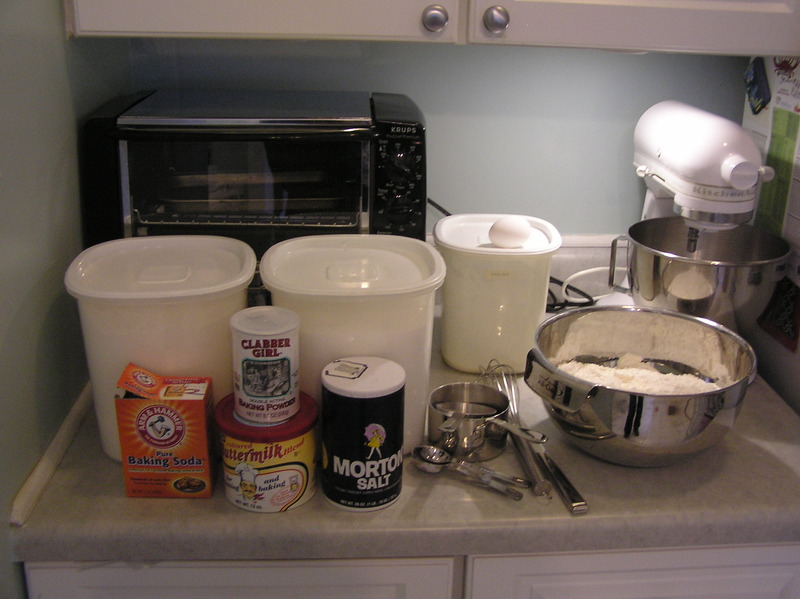 You didn’t have to buy mixes OR make things from scratch. Magical! Now it costs 4 times retail on Amazon. But I bet its still awesome. I’ve really only used four mixes from the book, but two of them are such standbys it has more than paid for itself. 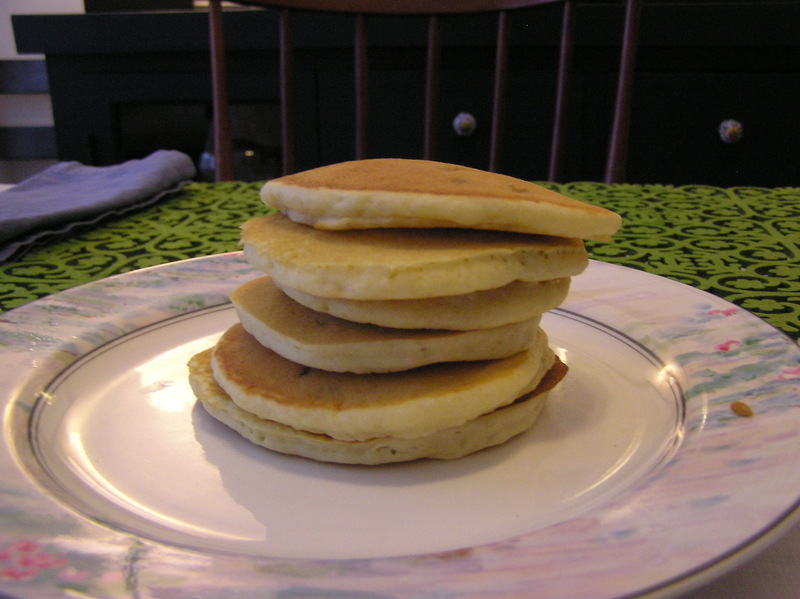 My favorite (and a recipe I’m known for) is buttermilk pancake & waffle mix. Directions: Put in large bowl (mine is a 5 qt, which is the largest I own). Stir together with a whisk to really mix it thoroughly. 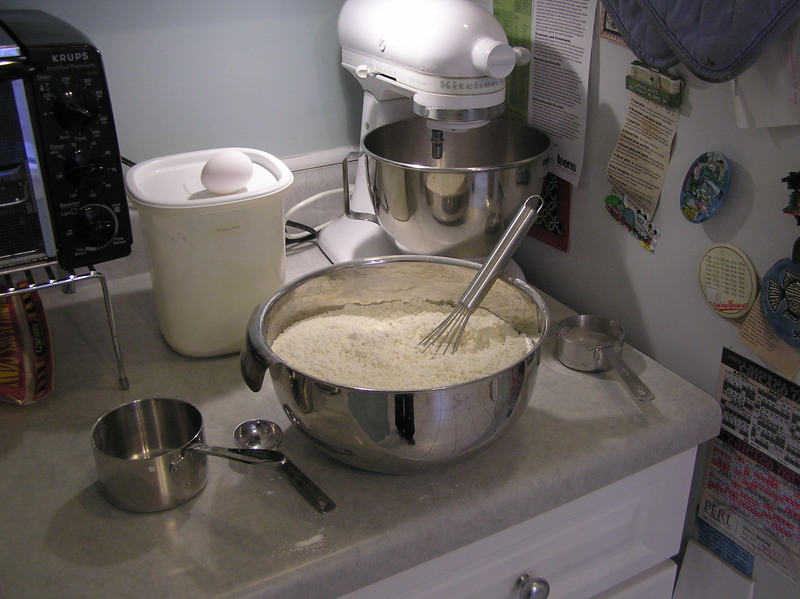 I always do flour and sugar first, because the buttermilk powder can stick to the sides of the bowl a bit. And I mix the little dry ingredients in with a partially dumped cup of flour because I think they blend better that way. But I may be making that up. After the mix is done, I put it in the medium Rubbermaid canister. Making the mix takes ten minutes tops, so its really easy–but even ten extra minutes is no fun when you just rolled out of bed on Saturday morning and want some breakfast. 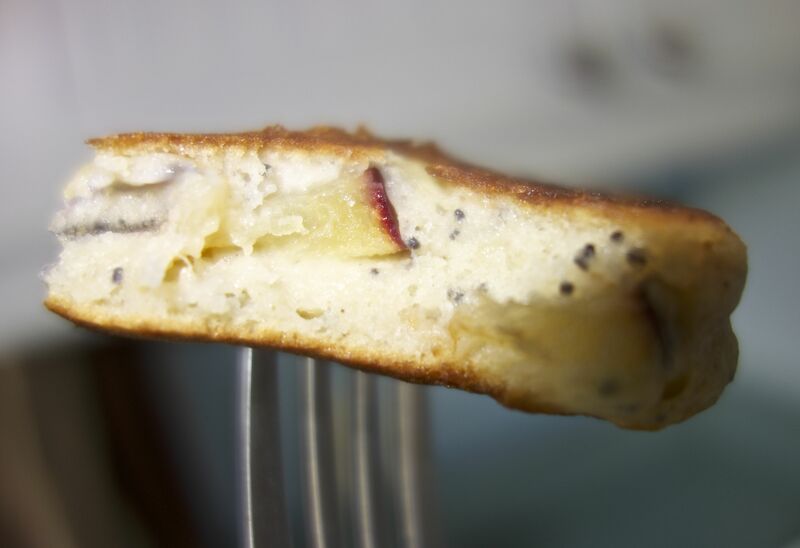 Which is why this mix is so awesome–now its like making Bisquick but better! And mix! 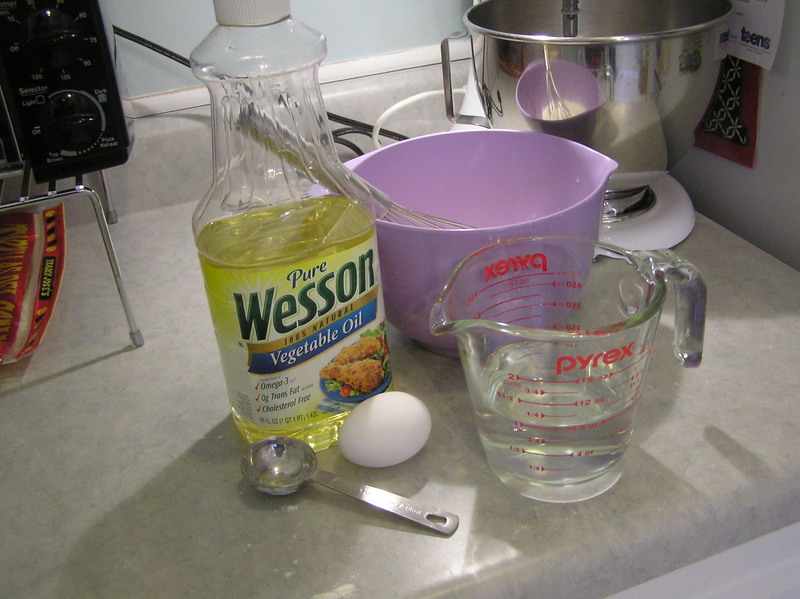 I leave a 1/2 cup scoop in my mix, so its just three quick scoops, then a cup of water and 2 tablespoons of oil. If I’m feeling fancy I crack the egg into the empty measuring cup and beat it quickly, but usually it goes right in the bowl. 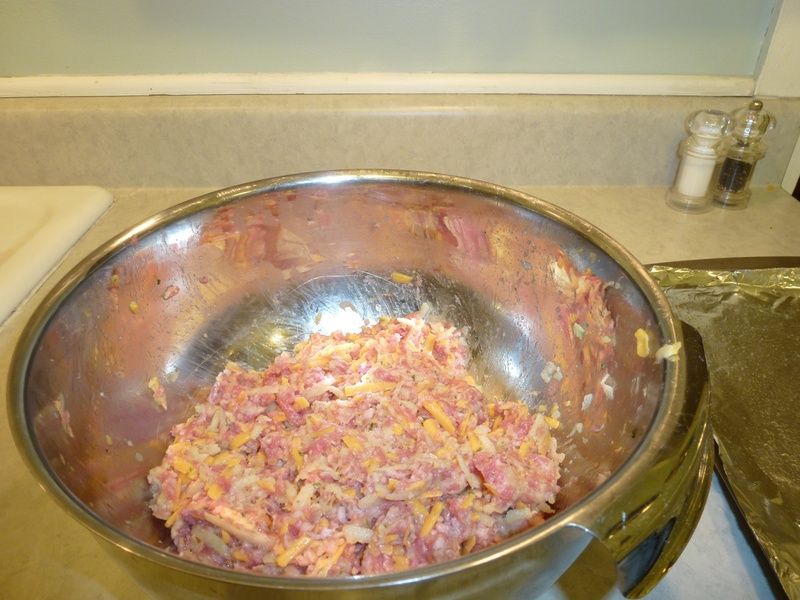 Mix until its all incorporated, but not any longer than you need to, scraping down once or twice for lumps. You can see the bubbles trying to rise to the surface in this bowl that has been sitting for about three minutes. These are a specialty on church retreats, and I always bring my own pan AND make a test pancake (why, yes, people do tease me for this. But they also love my pancakes). On my own stove I don’t need to make a test pancake, because I know that 7 is the right setting, but its well worth the time. Know when to flip! The test I always do is to throw a little water on the pan. Its never a good idea to put food (of any type) on a pan that isn’t finished heating (you won’t notice as much with a nonstick pan, but that doesn’t make it a good idea). If the water sizzles and evaporates, the pan is ready for some pancakes. If it takes a little bit, adjust the heat if needed or just be patient. It will be warm soon. 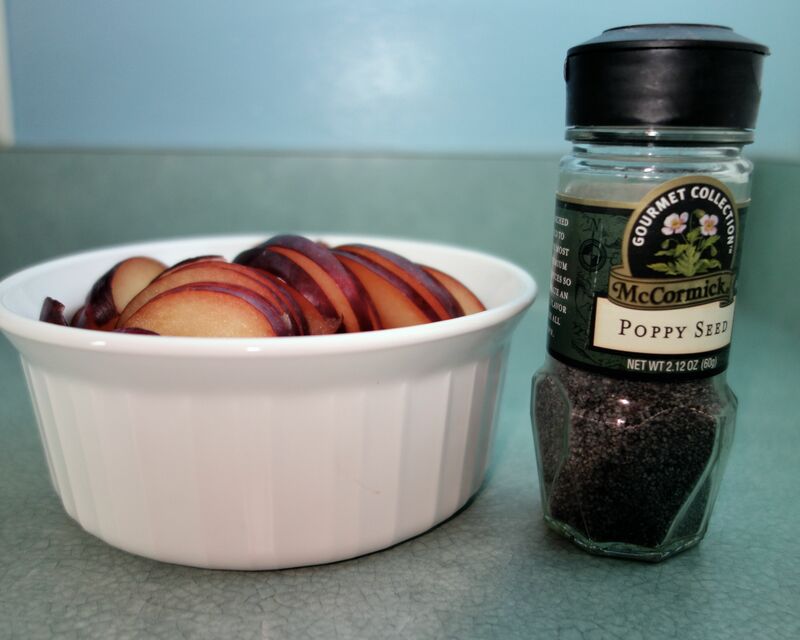 If you have any mix-ins (mini chocolate chips! blueberries! walnuts!) throw them in now. I actually don’t do them all at once, and stir IMMEDIATELY before pouring–otherwise they just sink, so the first one will have three sad little mini chips and the last one will be chips barely held together by trace amounts of pancake. 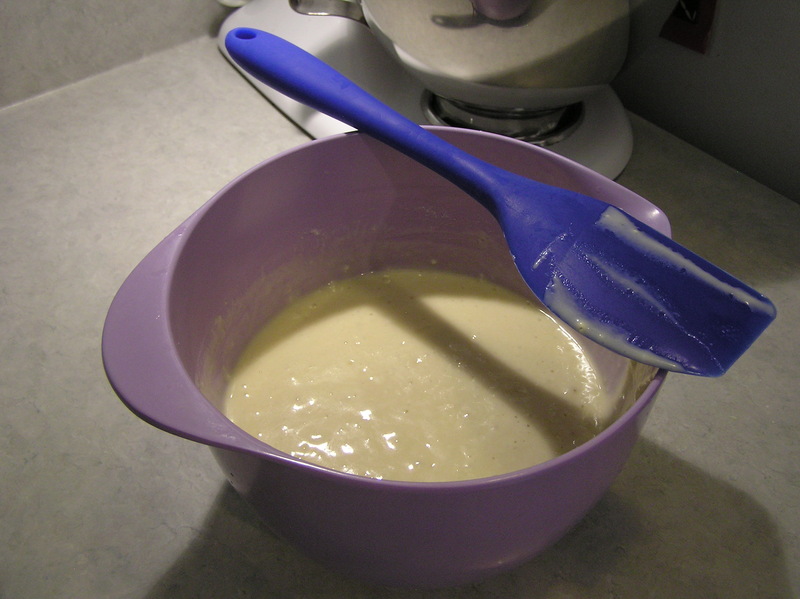 It isn’t cookie dough–batter doesn’t suspend things well. 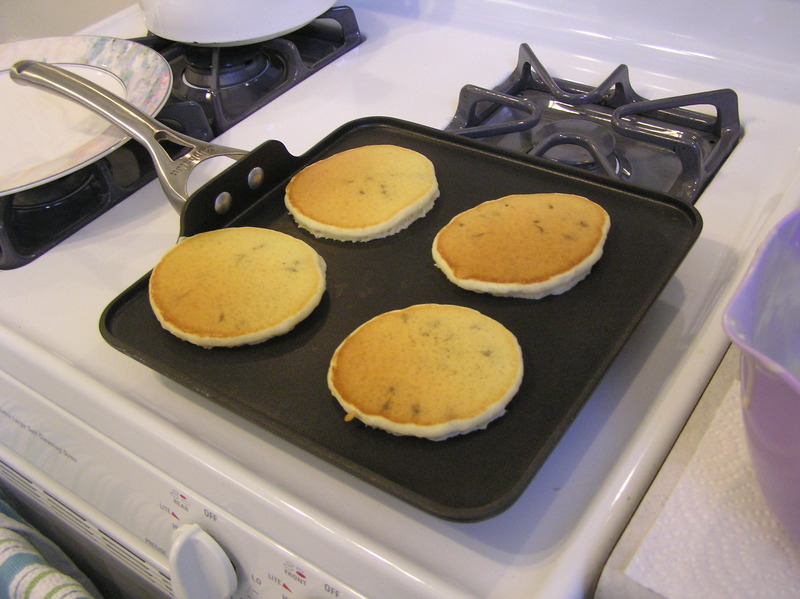 So I throw in a small handful of mini chocolate chips, give it a quick stir with my scraper and pour out some pancakes. I love my square pan. Much better than the pair of 8 inch fry pans we used our first semester in our college apartment. They are ready to flip when you see a good number of bubbles, as above. Delicious! 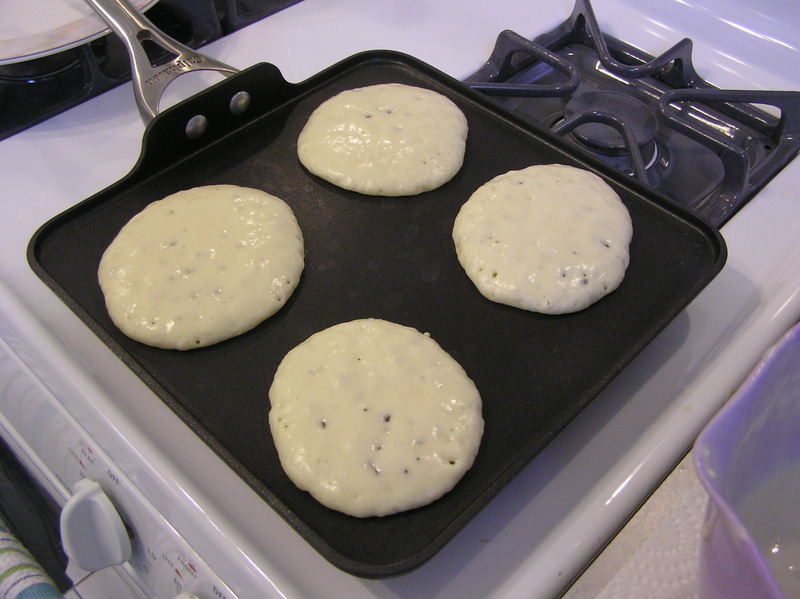 Keep a plate on an adjacent burner to stack up the pancakes on–and if something is in the oven, close to the vent. The added heat will keep them warm and ready. So, what have I been up to? Running. Lots and lots of running. I’ve been training for a marathon for months and the last few weeks have translated to a lot of running and very little of anything else. But the big day is this Sunday, and then I’ll catch you up on what I’ve been doing–because I did squeeze a few fun projects in. I’ve also been struggling with the CSA the past month or so. It’s been a hard year for the farm, and I completely sympathize with that. We had a hot dry summer, and they lost some crops. That’s part of the gamble you take when you join a CSA. At the same time, though, it’s hugely disappointing to have the amount of food you are getting in each batch drop off at the same time you are switching to a half share. See, in the spring, I was getting vegetables every week. Almost more vegetables than I could reasonably eat. My grocery bill fell significantly because I was getting big deliveries of produce with a lot of variety every week. But when the summer share started, and I switched to half share–or every other week delivery–the amount of food I received each week also fell. 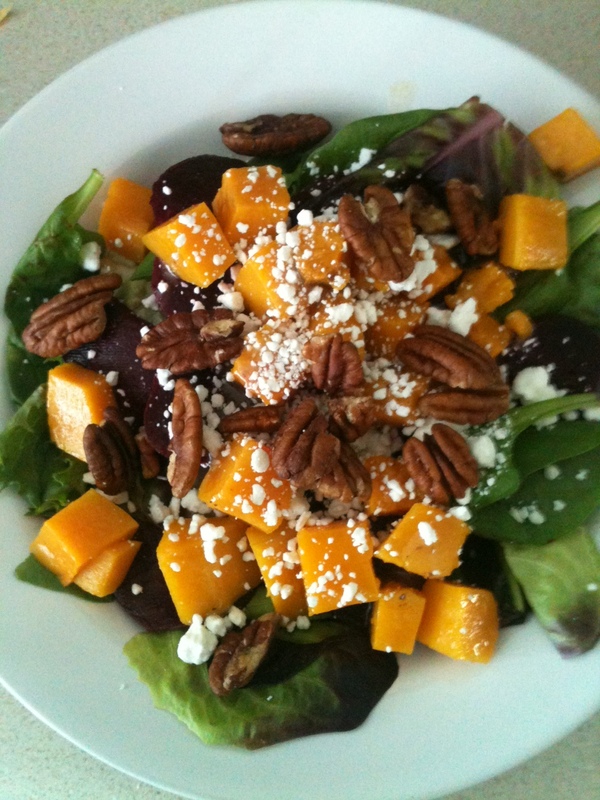 I also stopped getting combinations of vegetables that were easily converted into well-rounded meals. So I’ve had to go to the grocery store to buy stuff to round it out, which is really disappointing when I’m pay so much money per month for veggies. 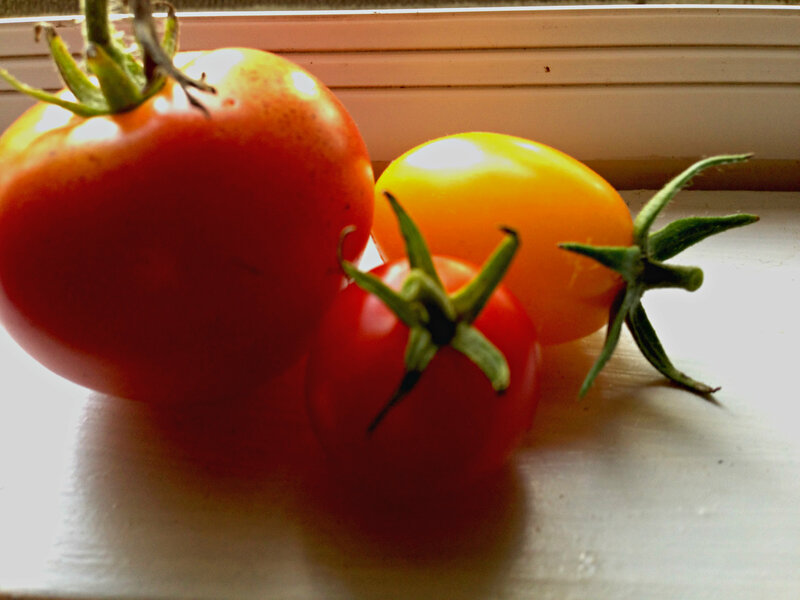 That’s not to say that I’m not happy with what I’m getting, just that I was expecting a little more–more tomatoes, for instance. Or zucchini. Or eggplant. 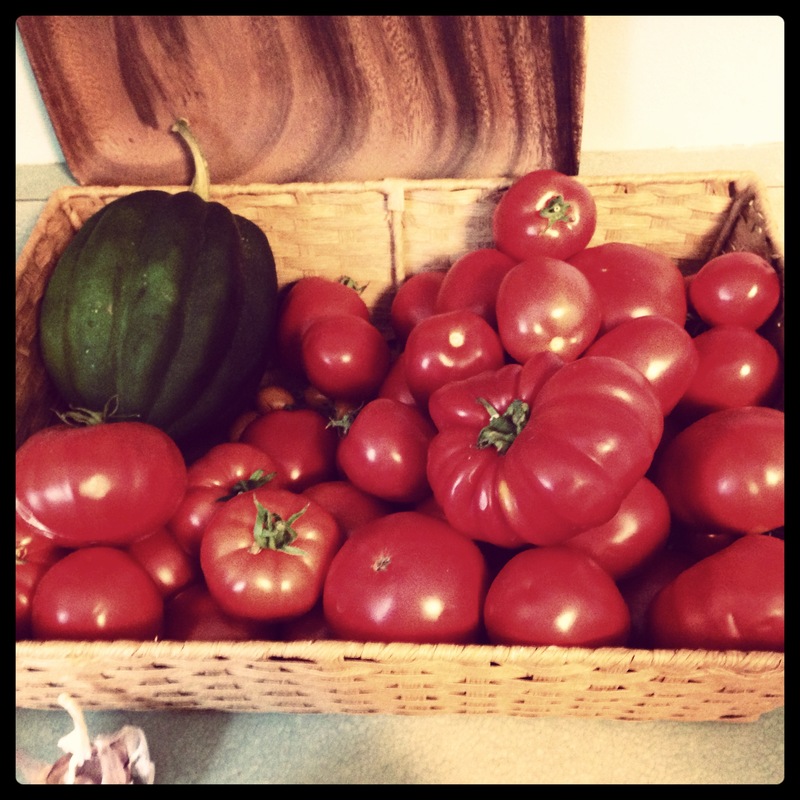 But I’ve actually gotten more tomatoes from my mom this year. We’ve definitely made the switch over to fall here in Milwaukee, and I’ve been taking advantage of the cooler weather and roasting most of my vegetables. This week I made a nice, almost stew-like batch of roasted veggies with potatoes, onions, cauliflower, turnips, and carrots. I sprinkled a spice mix (Forward from Penzey’s, a paprika-based blend), salt, pepper and little bit of honey on top and baked for about an hour. That’s the type of simple meal I’ve enjoyed. 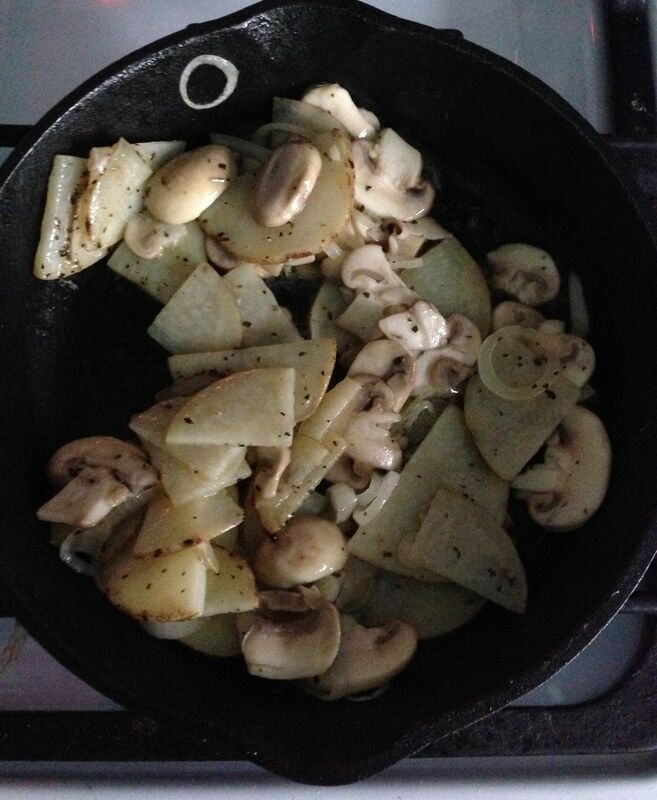 Not too exciting, but a great way to get a hearty meal out of a random mix of vegetables (note: I bought the potatoes and onion at the store to round out the veggie mixture). Hopefully as the season winds to a close and I started getting fall squashes, I’ll feel more inspired.